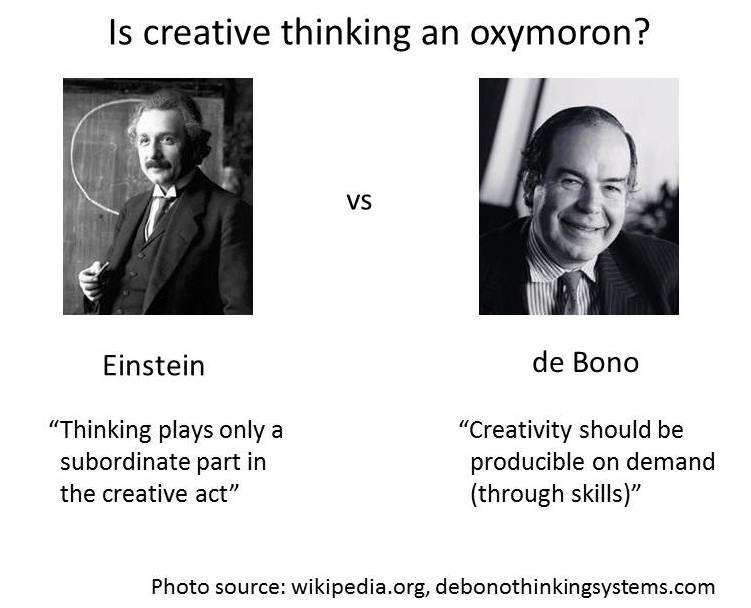 Catalign Innovation Consulting: Is creative thinking an oxymoron? ‎Vinay, I like your process of simplifying. And in such a short way! I loved the quote "Creativity is associative memory that works exceptionally well. Mednick’s definition of creativity connects both Tolle and de Bono. When Tolle says that thinking should stop, I feel he means that the interference due to the slow mode of thinking (system-2 or rule governed) should stop and let the intuitive thinking take over.." .. very well written and interesting article. Thanks Shali. I like Mednick's definition of creativity too. "creative thinking is an oxymoron would depend upon the type of thinking involved." My 2 cents. IMHO, both Einstein and Bono are right. The problem is with the phrase "creative thinking". To me, its not an oxymoron but an union of two different words which are actually two different stages of what we call, a "thought". 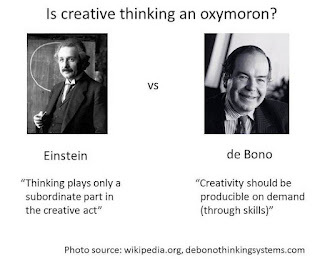 I guess, Einstein is talking about plain "creativity" (or intuition) whereas Bono is actually talking more about "thinking" than "creativity" (although about different ways of thinking about the same thing). Can thinking systematically about the same problem in different ways be called "creativity"? Not according to Einstein it seems, as he is talking about a step further, actually. So, what's the relation between creativity and thinking? After one has thought about the same thing in different ways (which, btw, requires training as Bono suggests, but IMHO is not same as "creativity") and exhausted all the ways of thinking; "creativity"/"intuition" can take over if one can keep his/her mind open. "Thinking" comes first, followed by "creativity" and both these are two different stages of a "thought" (or how a "thought" gets generated). Somewhere Einstein had mentioned that the real "intuition" / "creativity" moments for him amount to not more than 3-5 minutes cumulative, for all of his work. For "normal" (non-Einstein and still "prolific") researchers, it is said that it amount to around 1-2 mins. All other lifetime is spent to prepare oneself for those moments spanning 1-2 mins and understanding/documenting/presenting results received in those moments. Ramanujan mentioned that Goddess Namagiri tells him the mathematical identities and proofs. That was actually the creativity at the highest order. Can one train oneself so as to get these moments more often? Maybe. Can we short-circuit the process and directly become "creative" without a need to develop different ways of systematic thinking? Ramanujan was, maybe, one such example, but this may not be true for mere mortals. But, without getting any of the intuitive moments, one can still master different ways of thinking and become successful everywhere. In "Where Good Ideas come from", Steven Johnson argues that the Eureka moment doesn't happen without years and years of engaging with a problem. Perhaps the brain continues to work even when "conscious thinking" has stopped or been suspended.